Buying clothes is a very bizarre experience for me now. I have to actually try things on, which is why I mostly stick to jeans and tees because I generally know what size to buy without needing to use a dressing room. I'd dare to say I'm a litle afraid of trying on cute dresses in my size, because the thought that it will fit me makes me feel a little scared. It's another one of those weird and inexplicable anxieties - I know I won't fit in a size 26 dress anymore, I need a 14 or a 16. But actually putting the smaller dress on makes the changes real - this is my life now. And opening up that world of possibilities - even if they're just clothes and shopping possibilities - makes me feel anxious. So instead of trying on things in my size, I intentionally try on stuff that is too small and that I know won't fit me, and I get a strange pleasure from doing so. It's a physical sensation that I knew well at 345 pounds - so even though it's not associated with positive memories, there's an odd comfort in the familiarity of feeling that way again. I used to try on cute dresses in the biggest size the store offered, it would be too tight in one area or another, and I'd lie to whomever I was shopping with and say I didn't really like how it looked on me, or I changed my mind about the color or the print. Last weekend, I was browsing a thrift store to see if I could find any pieces of the vintage Pyrex that I love, and I noticed a rack of dresses. I leafed through them, and saw a yellow one, knee-length, with a sash and a bit of ruffle around the neck. Size 12. It was adorable, but I thought, A size 12 will never fit me. And I turned back to the pots and pans. Then I went to the gym, and I couldn't stop thinking about the dress, but not in the wanting-to-feel-it-not-fit way. I thought about how it won't fit me now (I'm about a 14/16 now) but it will definitely fit me someday, and that day might even be soon ... maybe before the end of summer! Not a great picture, but I love it, and I can't wait to wear it, to see how it looks with my curves shaping it. I try not to set specific dates for my weight loss goals - I just want to get healthy, and I already put enough pressure on myself without the possibility of getting upset that I didn't make a deadline to lose a certain number of pounds. But I've set a goal for this dress. I want to fit into it by July 31, 2011. That's exactly four months from today. That's the one year anniversary of my decision to get healthy. I'm going to wear this dress on my rebirthday. Awwww the dress is soooo pretty! I'm a size 12 right now (almost 10) and I have this pair of jeans I bought in Fall 2009 (size 10) that were too tight on me but I was bound and determined to lose weight for them to fit me....then that's when I gained another 15-20 pounds....and I could barely get them up and had about 4" of not being able to do them up. Now I'm back to being bound and determined to wearing them. I can do them up again (success!) but they create a lot of lady lumps. I am determined to fit into them by May. It's nice to have outfit goals! My guess is though... that dress will be too big for you in July. My guess is you'll be wearing it by June! Love! I can't wait to see you in that dress!! THIS is a perfect post.... it shows the essence of the changes...You went back and GOT THE DRESS! It's beautiful! It's such a cute dress! I know what you mean about trying on clothes...I still mentally tell myself that I can only go shopping at Lane Bryant or Avenue, even though I'm on the cusp of being able to shop in "normal" stores... But there's anxiety that comes with it, it's such a weird sensation. I've never heard it called a "re-birthday", but I LOVE it! And that dress is totes adorb. Can't wait to see it. 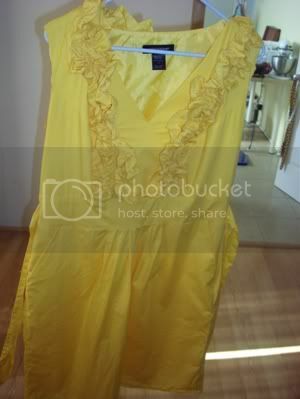 I love yellow and I love ruffles and that dress is so cute! I love that dress! That is great motivation! You can do it!! Size 12 is just around the corner! Be sure to take a picture of your cute self in that dress on a blog post! I love yellow dresses! What a great motivator! That's a gorgeous dress, and what a wonderful goal and way to celebrate your rebirthday. Oh my! What a great thrift store find! I can't wait to be smaller, because thrift shops are filled with great vintage pieces, but for smaller ladies. I'll be there someday. Maybe (HOPEFULLY) I can find an adorable dress like that, too.